The library’s History Room houses resources that pertains to the history of the City of Hudson, Greenport and Stockport, as well as Columbia County and New York State. Among the holdings are sets of Hudson City Directories, Hudson High School’s Blue and Gold Yearbooks, early editions of poetry books by Edna St. Vincent Millay, historical periodicals, vintage postcards, and photographs including the Neefus Collection and photographs from the Rowles Collection. The archival collections contain newspaper clippings, original documents, photographs, local history booklets, pamphlets, and local oral histories. 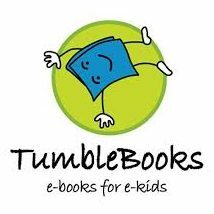 The books are all cataloged and searchable online in the Mid-Hudson Library System. The archival collections are organized by finding aid and container lists, which are available on this webpage. The primary mission of the Hudson Area Library’s History Room is to acquire and preserve holdings regarding the history and culture of the library’s service area including Hudson, Greenport and Stockport, and their residents as well as to maintain, preserve, and protect the collection in a secure, conservation-quality repository while providing access to its holdings. Secondarily, the mission of the History Room is to acquire and preserve the history and culture of Columbia County. Please contact Paul Costa at the library: 518-828-1792 ext. 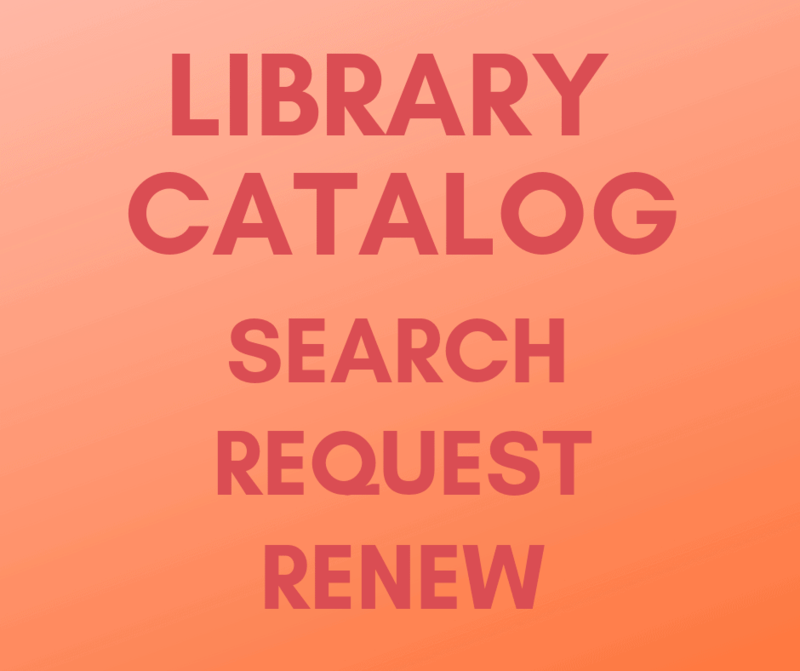 103 or reference@hudsonarealibrary.org for more information or to schedule an appointment outside our regular hours. Click here to access our Research Request Form. Our dedicated History Room volunteers will then search for the items and information you need. Please allow a minimum of 2 weeks for our volunteers to complete your request. If you are inquiring about a specific building in Hudson, please email reference@hudsonarealibrary.org with your request, a photograph of the building with the address clearly labeled, and one of the immediate surrounding area, such as a view of the block or adjacent buildings. Click on the links below for Google Docs containing information on our Hudson and Columbia County Archives. Outlines of Container Lists will help you find the subjects for which we have documents, while container lists will show you the exact documents we have archived. Hudson River Valley Heritage (HRVH) provides access to historical materials from digital collections contributed by colleges, libraries, archives, historical societies, museums and cultural organizations from the various counties in New York State. 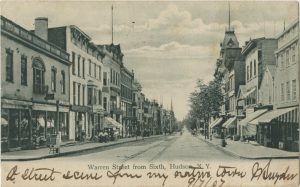 You can find images of postcards from our collection as well as Hudson-Fulton Tricentennial materials. Click here to see our collection. Gossips of Rivertown (http://gossipsofrivertown.blogspot.com/) has news, commentary, and history about the City of Hudson. Photo by Gibson (http://photobygibson.com) holds the collection of Howard “Howie” Gibson, a local commercial photographer who captured live in the region for much of the mid-20th century. 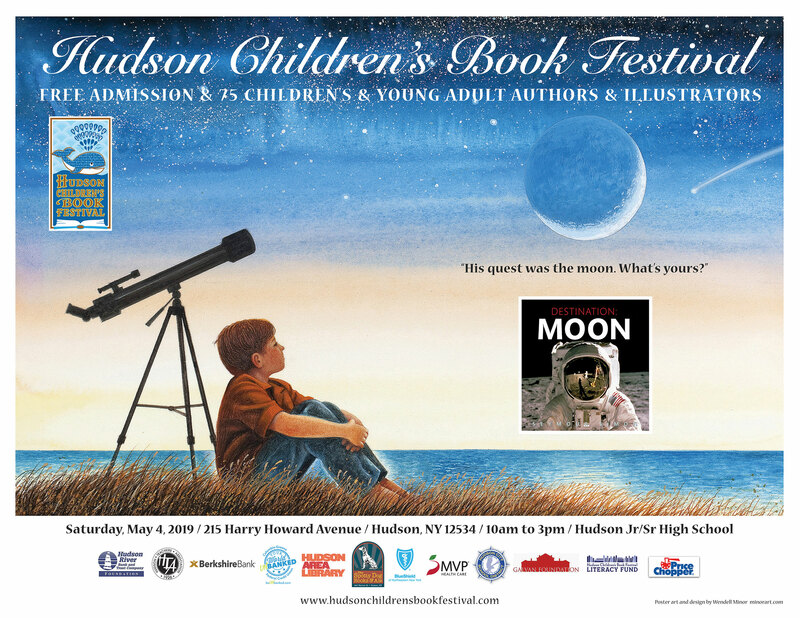 The Story of Hudson (https://www.storyofhudson.com/) is an introduction to the visual and cultural history of the City of Hudson, NY. 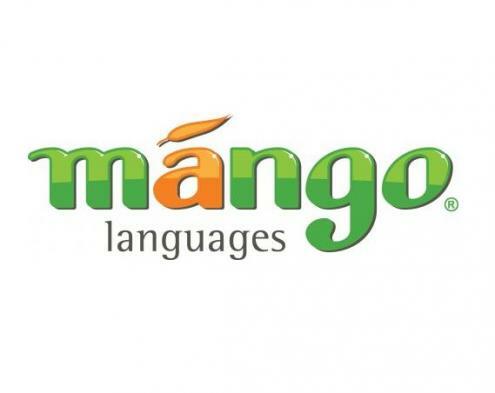 Ancestry (https://Ancestry.com) is an online genealogical service. FamilySearch (https://familysearch.org) is an online resource, supported by The Church of Jesus Christ of Latter-day Saints, that is dedicated to connecting families through their shared history. NYS Historical Newpapers (http://nyshistoricnewspapers.org/) is a database of historic newspapers in New York state, with options to search geographically by county. 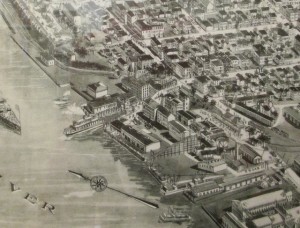 Detail of portion of the 1923 aeroview map of Hudson. The panoramic map was a popular cartographic form used to depict American towns in the late 19th and early 20th centuries. Known also as bird’s-eye views, perspective maps and aero views, they are non-photographic representations of towns portrayed as if viewed from above at an angle, not generally drawn to scale, and showing street layouts, individual buildings and landscape features, in perspective. 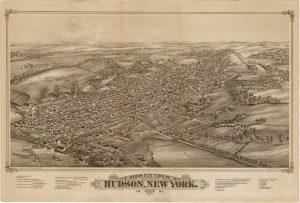 The Hudson Area Library History Room has two original aero views of Hudson, from 1881 and 1923, both for sale as copies. Prints are available at The Spotty Dog Books & Ale, 440 Warren Street, Hudson and the Hudson Area Library, 51 N. 5th St, Hudson. Proceeds from these sales will go to the library. 1923 Aeroview Map (Framed) $450. This item cannot be shipped. 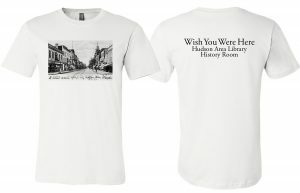 This shirt displays the historic postcard of Warren St. from Sixth St., our featured postcard from our exhibit, Wish You Were Here: A Look Back at Life in Hudson Through Vintage Postcards. The shirts are available for $20 in Unisex sizes Small, Medium, Large, and Extra-Large, and in Women’s sizes Medium, Large, and Extra-Large. These notecards display the historic postcard of Warren St. from Sixth St., our featured postcard from our exhibit, Wish You Were Here: A Look Back at Life in Hudson Through Vintage Postcards. They are available for $4 each, or as a pack of six for $20. Below are videos of library programs, including our local history talks, recorded by Dan Udell, and videos of Hudson throughout history courtesy of Peter Cipkowski. Click on the top-left menu in each player for links to the full playlist. Click the link below to view the text featured in our postcard exhibition from 2018. Click here for a Google Doc containing additional sources of historical research in Hudson, Greenport, Stockport and the surrounding area, including town, city, and county historians. 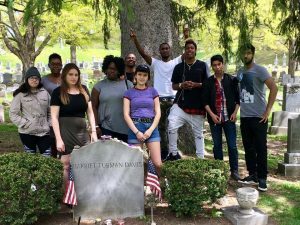 Students from Hudson Community School’s Writing Center at the Harriet Tubman grave site in Auburn, NY. Through a New York Humanities Action Grant given to the library with matching funds from Hudson Community Schools, high school students at the Writing Center studied primary source documents, photos and places about the abolition and suffrage movements in our local area and New York State. Click here to view our Zine of their work. The Armory is a visual landmark and center for much community history. Besides functioning as an armory for the National Guard and its antecedents, many area residents recall attending high school proms, auto shows, wrestling, Harlem Globe Trotters basketball, and many other events in the Armory. Most recently the Armory was home to the Armory Art and Antique Gallery. Read more.